The short history of Vagus Nerve Stimulation (VNS) in treatment resistant depression is hampered by some drawbacks. Scientifically the results of a double-blind randomized sham controlled trial with no definitive evidence of short-term efficacy for adjunctive VNS in treatment resistant depression were of major importance. Of human interest was the undisclosed background of Dr Nemeroff, then editor in chief of the journal in which he published a review about VNS for treatment resistant depression. Not only did he not disclose his position as head of the “mechanism of action” advisory board at Cyberonics; the paper’s first draft was written by a ghostwriter hired by Cyberonics. You can read more about the Nemeroff Saga at Clinical Psychology and Psychiatry. Cyberonics is the firm making these devices. 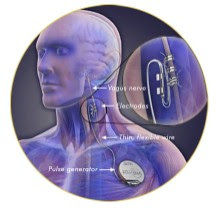 VNS therapy includes surgical implantation of a small battery-operated pulse generator – similar to a pacemaker – in a patient’s left upper chest. Thin, flexible wires from the device are tunneled into the neck and send mild, intermittent pulses to the neck’s left vagus nerve. The vagus nerve in turn delivers these pulses about every five minutes to the areas of the brain involved in the regulation of mood, motivation, sleep, appetite and other symptoms relevant to depression. A 12 month naturalistic follow-up study after the acute phase trial with VNS used as an adjunct to other antidepressant treatments in patients with treatment resistant depressions revealed a statistic significant decrease of 0.45 points/month on the 24 item version of the Hamilton Depression Rating Scale. Response defined as a 50% or more reduction of HRSD score was achieved by 27.2% of patients (55/202), remission defined as a final score of 10 or less was present in 15.8% of patients (32/202) after 12 months (LOCF). Both the VNS and the other antidepressant treatments could be adjusted during this 12 month follow-up. A third study in the same issue of the journal Biological Psychiatry tried to add a non-randomized control group to the first two studies mentioned above (acute phase trial and the 12 month follow-up). This control group was not intended to serve as a control group but was originally intended to serve as a group for comparison of health care costs. Besides switching the purpose of a control group the study was not randomized nor blinded. The use of only the secondary positive outcome from the first trial makes the results of this trial in favor of VNS with treatment as usual compared to treatment as usual questionable. A very recent trial in Europe was an open uncontrolled multi-center study. This trial used the same protocol as the first open, unblinded four center pilot study of 60 patients in the US. The authors mention the argument sometimes used that it is unethical to use a controlled design with a sham condition. We are talking about patients treated with 3-7 different antidepressants and/or ECT. Mostly ill for years. I think it unethical to conduct another uncontrolled trial which will help our knowledge about the efficacy of VNS no further. Besides implanting a VNS is not peanuts nor going to a protocol of up to 1 year. It is hard to make a final conclusion on the clinical relevance of these outcome data. The response and remission are not impressive, nevertheless the patients in these trials are usually depressed for a long time and they have been treated with several antidepressants including ECT. The question remains whether these benefits of VNS can be attributed to VNS or the natural course of depression or other possible confounders such as the concurrent treatment during the trials. At least VNS could be well tolerated by the participants and these trial suggests a potential long-term growing benefit of VNS in treatment resistant depression. The clinical relevance of this growing benefit needs to be established. Something worth while examining in the future in a double blind fashion.